"The stars know everything. Powers of the Negaverse, I seek your guidance now more than ever. I need you to show me Sailor Moon's greatest weakness, so I can be rid of her." Disc three of the English version of Sailor Moon carries on with the same basic formula seen in previous episodes: villain Neflite consults the Negaverse to locate a suitable victim to steal energy from, and the Sailor Scouts come up with a way foil his plans at the last minute. The scenarios are somewhat creative, from unleashing the power of vanity to pre-wedding obsessiveness, or masquerading as one of the good guys. The evil Queen Beryl continues to plot her conquest of the universe, but her allies just aren't a match for the power of the Sailor Scouts. So far, we have a trio of scouts: Serena, aka Sailor Moon, is a clutzy blonde with little self confidence. She is getting better at confronting her Negaverse adversaries, but still would rather chicken out most of the time. Luna, they Scouts' talking cat, is constantly chagrined by the antics of the team leader. Amy, who transforms into Sailor Mercury, is the brains of the group. Unlike Serena, Amy is very serious when it comes to her school work, and her Mercury Bubble attacks act as a diversion for the Scouts. Raye, a shinto priestess, lives with her grandfather at the Cherry Hill Temple. She has a crush on Darien, and uses her Fire Ignite spell when battling as Sailor Mars. While we don't see the arrival of any new scouts this time out, a few new elements are added into the series. Amy gets a love interest and Serena's friend Molly takes on a bigger role when Neflite mistakes her for Sailor Moon. We are also introduced to the latest quest for the Negaverse minions—a set of powerful crystals that have been hidden in the bodies of unsuspecting humans. Extracting the crystals changes them into huge monsters, which prove a challenge for the Sailor Scouts. 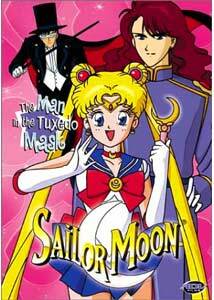 Tuxedo Mask also plays a larger role, as he tries to find out his own identity, and unravel the mysteries of his past, which include visions of his involvement with the elusive Moon Princess. The relationships are growing in complexity, as Neflite tries to unearth the secret identities of the Scouts. Serena is jealous of everyone, and Molly's new found love is cause for distress. While the outcome is predictable, there is enough character here to provide light entertainment for all ages, even if the moral messages are targeted to younger children. Image Transfer Review: Image quality is on par with the previous two discs. There is some softness in places, and colors are good, if less vibrant than more modern shows. Technical deficiencies are minor, evident in a bit of cross-coloration or the odd compression defect. Grain is evident, but does not look unnatural. Audio Transfer Review: Audio quality continues to be impressive despite a rather run of the mill soundtrack. Dialogue is clear, there is no distortion or excessive sibilance, and the bottom end is impressive for a show of this age. Extras Review: Again, on disc extras are limited to ADV previews for Princess Nine, Sonic the Hedgehog,Sakura Wars, Shadow Raiders, Ruin Explorers, and Medabots. Another six episodes expand on some of the personality clashes, and build on the characters. New elements are brought forward, setting up for the next shift in the storyline.